The Palazzo Farnese is a 16th century palace-turned-museum in the northern Italian city of Piacenza. 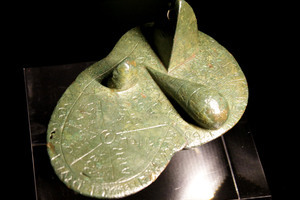 Inside is something 1,600 years older than the palace itself: a bronze model of a sheep’s liver containing the whole cosmic order known to the ancient Etruscans. The palace was built by the Duke and Duchess of Parma in about 1550, but shouldn’t be confused with the Palazzo Farnese in Rome (there you can drop in on the French Embassy, but you won’t see an Etruscan sheep’s liver). It’s open to the public for tours of the rooms and furnishings, and they have some Botticelli and other important paintings, some friezes and frescoes, and some ancient armor and weaponry. But their prized possession is this little liver. The Etruscans were the people centered in the area now known as Tuscany, before their civilization was absorbed by the Romans. They date from about 800 BCE to about 300 BCE, and they had their own language, religion, and view of the cosmos. They also practiced a form of “haruspicy,” the art of reading the future in animal entrails (goats and sheep mostly), and they were especially fond of reading livers. This bronze one, dug up in 1877 in a field near Piacenza, dates from about 200 BCE — a time the Etruscans were already under Roman rule. It’s thought to represent their view of the Earth, the sun and moon, and 16 heavenly bodies. Each of the areas then corresponds to its relevant god. It was likely used as a kind of celestial map and key to interpreting events that happened in each of the zones — a sort of “how-to” for would-be soothsayers. It’s fairly small, about five inches by three inches, but with a lot of information packed in. From certain angles it looks like a guy with a long bulbous nose winking at you. Maybe he's been a haruspicy skeptic.